I recently taught my friend Jenn how to knit, and it got me thinking about when I started to knit. It was just over 3 years ago that I began my first knitting project. I searched the web trying to figure out everything I needed to know. Went to one site for one thing, another for something else. Long story short, it was way too time consuming and frustrating to figure out what I needed to know to begin knitting. So! I decided it would be a great idea to explain everything it is you need to know (and not know right away) to start your first knitting project! This will probably be my longest post yet, but very thorough by covering every essential detail and most likely answering every question you’ll have. PLEASE ask me if you have a question unanswered in this post. ** If I “*” a sentence, I will elaborate more as you read. Find a simple pattern ( preferably something flat like a scarf) that uses thicker yarn, or uses at least size 6 needles. There are all different size needles and yarn, which I will explain later. * The best way to not go crazy in the yarn store is to know what you’re looking for. Ravelry.com is a great site that has any pattern you could possible want. Sign up for free and do an advanced search to find a pattern. You can customize your search to what you’re looking for (needle size used etc.) or, if using another site or pattern book, the pattern will tell you what you need to get started. So look at the needle/yarn size to make sure it’s what you’re looking for. I strongly recommend thicker needles and yarn because it is easier to see your stitches. As a new knitter, you’re going to what to see what you’re doing so you can figure out how your stitches link together. Needles come in three basic forms : circular, straight or double pointed. 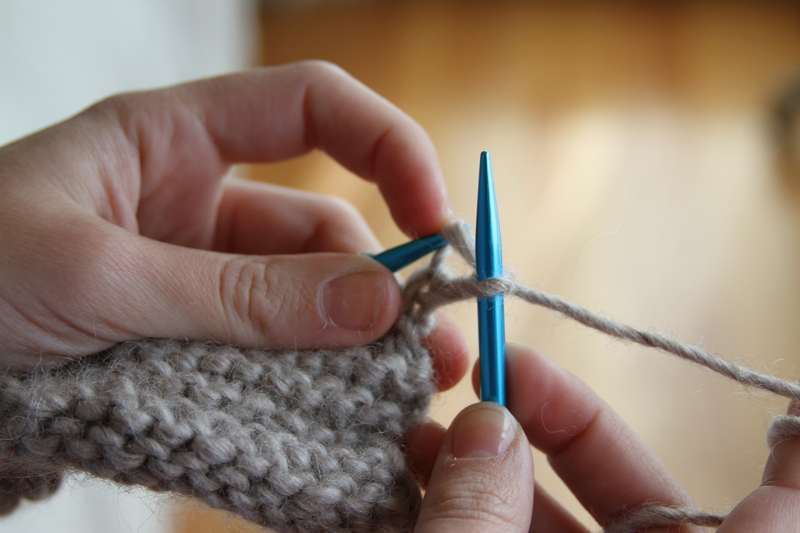 Circular needles are for making larger things such as a blanket or a sweater. Or tubular things like hats. 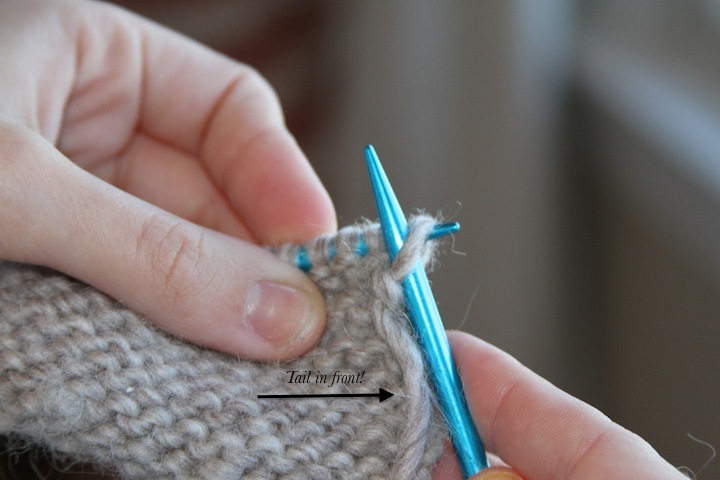 When knitting with CN you are knitting in the round, which means it is continuous and do not have to change the needles to different hands when you finish a row. I will talk about knitting in the round in another post. Circular needles are two tapered needles joined together by a strong plastic cable. They come in various lengths ranging from 12″ to (about) 47″. These are my personal favorite because anything you can do with straight needles, you can do with these. It’s silly to buy straight needles and CN of the same size. Trust me, it makes sense. Straight Needles generally are 10-16inches in length, and are limited in use. They are mostly used for scarves or small flat things. 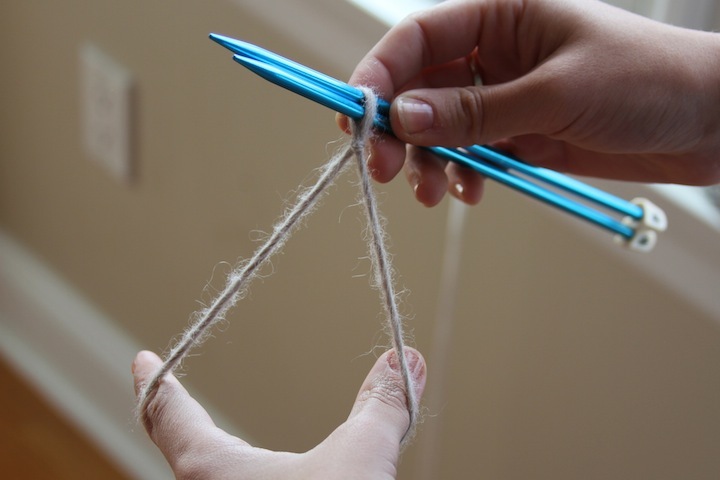 Double Pointed Needles are used for making small tubular things such as gloves, socks or hats. They are slightly different to use than the previous two types because it involves 4 or 5 needles instead of 2. They are great if you want to make certain things, but not ideal for traveling because the stitches can easily slide off. They do sell stitch stoppers, but I don’t trust them. Needle sizes range from US 4- US35 with about 15 different sizes. The smaller the number, the smaller the needle. YARN! YARN! YARN! There is a plethora of yarn out there from different colors, to fibers and textures and weights. So, you’re at the yarn store and you have your needles picked out, and now it’s time for the hard part: choosing yarn! Which one? How much? WHAT COLOR?! But, you have you’re pattern and needles picked out, so your selection is limited. There are 2 very important things to do before you rip open your yarn, then get it all tangled up. 1. SAVE THE LABEL! This is sooo important especially as a beginner because it has all its information on it. It tells you, what needle size to use, care instructions, lot number* and gauge*. Buy a box (mine are in a single-bottle wine box) and tape or tie a piece of the yarn to the label. This is helpful when, you have some left over from a past project and you want to use it again, or you want to buy more of the same yarn. 2. 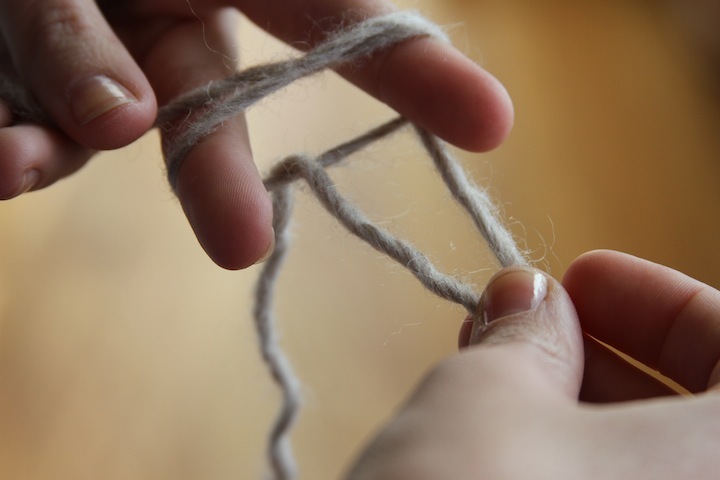 ROLL THE YARN INTO A BALL. The general image of yarn is a ball that cats like to play with. But yarn is not sold that way. There is no one way it is packaged, but it should always be wound into a ball or it WILL get tangled. Generic yarn that you buy at a big name Craft Store will usually be in a log shape, fancily wound with the yarn making a zigzag pattern. The end of the yarn (visible or easily found) should NOT be touched. Instead, go into the center of the “log” and pull out the mess on yarn. In here, you will find the other end. With this, you can beginning winding it by wrapping in around your fingers a few times, then fold it into a ball. 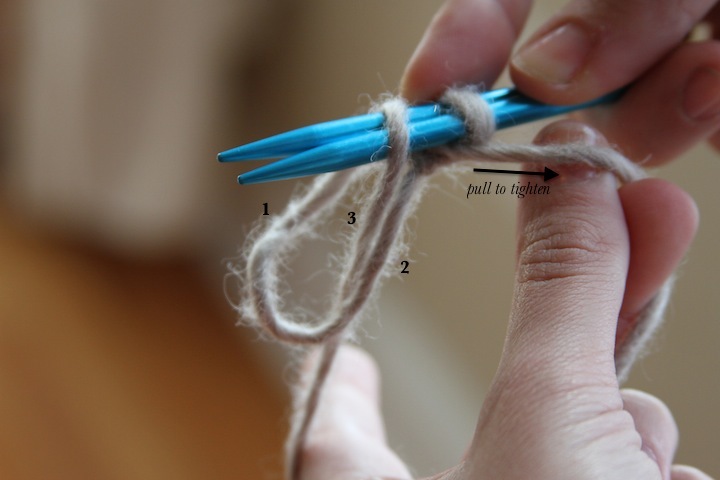 Continue wrapping the yarn in different directions until you run out of yarn. Other yarns bought at a specialty store are not at complex. You simple find an end and start winding. Some stores may have a yarn winding station that you can use once you’ve purchased your yarn. Ok. Actually. 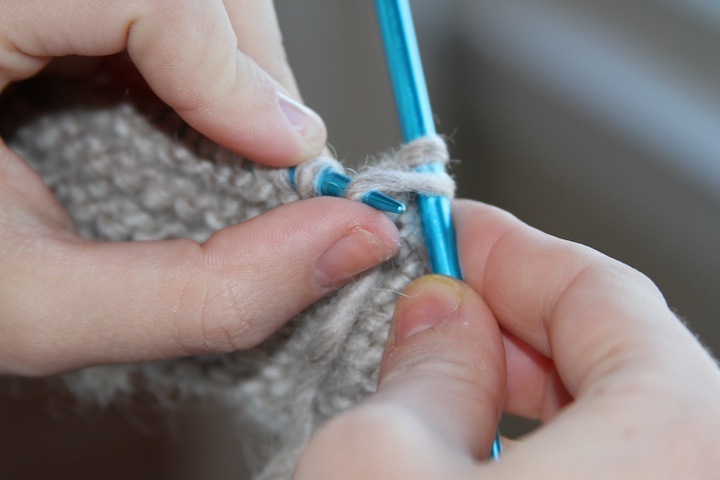 Before you can start knitting, you need to cast on your stitches. It is the hardest part, but once you get the hang of it it’s very rhythmic and relaxing. There are 2 basic ways to CO: single or double. I am only going to teach you double (or long-tail) CO because it looks nicer and it has more give. To begin your CO you will need to make a slip knot, with a long tail that will accommodate for the stitches you will make with it. You also want some extra at the end to weave in later on. * Depending on your project and needle size, you will need more or less. Some knitters do not like this method of CO because there is no true way to measure how much you need. But it’s better to have enough, because if you don’t have enough, you need to take your stitches off and do it all over again with a longer tail. I would multiply the width of the project by 2 or 3 depending on the size of your needles/yarn, then add extra for the tail. 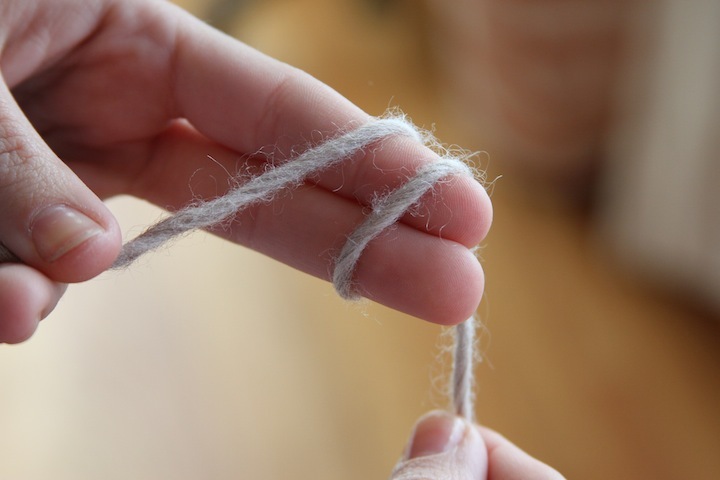 So… to make a slip knot, wrap the yarn around two fingers twice. 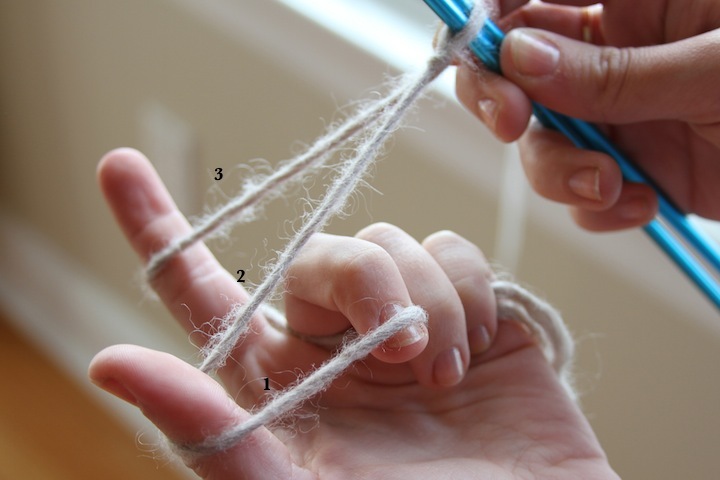 Spread your fingers and bring the tail through your fingers and make a loop. Now that you have your slip knot, we are ready to CO! 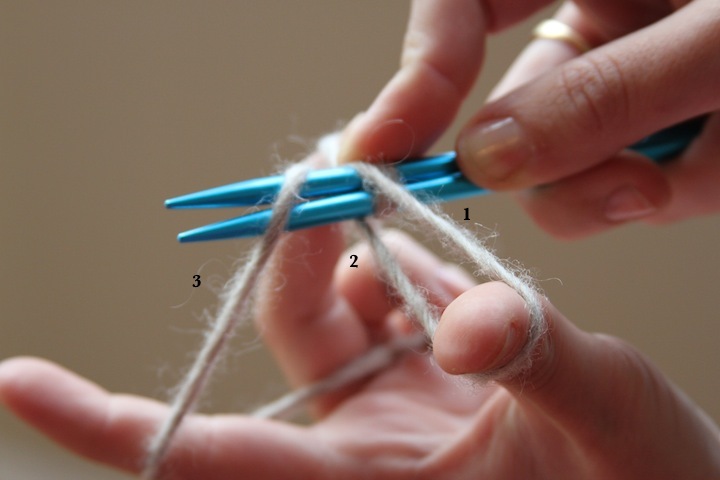 With your needles in your right hand, take your index finger and thumb and bring them between the two strings. Still in the original position, gather the two strings in the ring and pinky fingers. Then turn your hand outward toward the left. Raise your middle finger so there are 3 strings forming the letter ‘Z’. 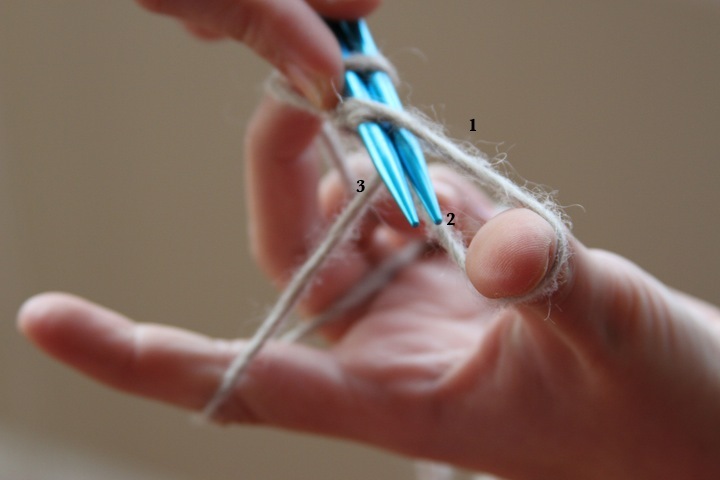 You will be using these 3 strings to form your stitches. Then grab 3 with your needles and bring it through 1 (skipping over 2). When you bring your needles back through, there will be a new stitch on you needles. Once you’ve brought your needles up through 1, release you thumb and pickup 1. With your thumb pull 1 to tighten the stitch. Then bring your thumb back to the left with 1 still against it. Your ‘Z’ formation should go back in place. Repeat this until you’ve reached your desired amount of stitches. 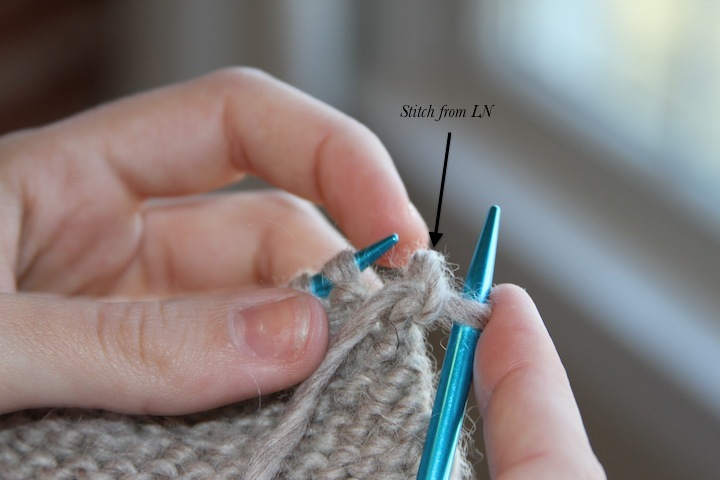 NOTE: The slip knot you made in the beginning will be taken off when you start knitting, so DO NOT count it as a stitch. NOW WE CAN START KNITTING!!!! There are many, many different stitches that create beautiful knitwear. But they are all done with 2 simple techniques: the KNIT and the PURL. Together, when the knits are knitted and the purls are purled, they create a stockinette stitch. 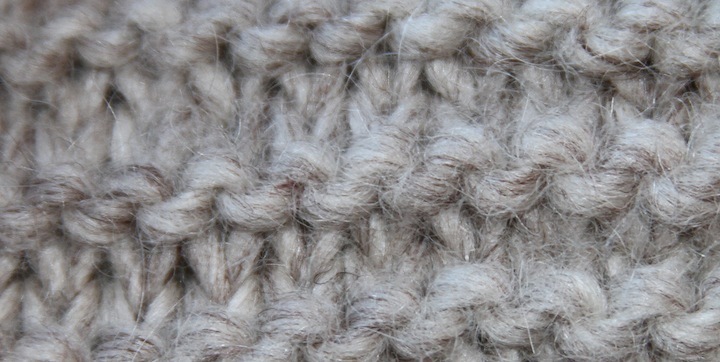 This is the stockinette stitch showing the KNIT side. This is the front of the work. This is the PURL side of the stockinette stitch. This is the back. You will eventually understand how it works and what it is you are actually doing. You will see that when you knit a row, and turn it to start the next row, the back of the knit row looks like a purl! If every row was knitted, or every row was purled, you will get a garter stitch. 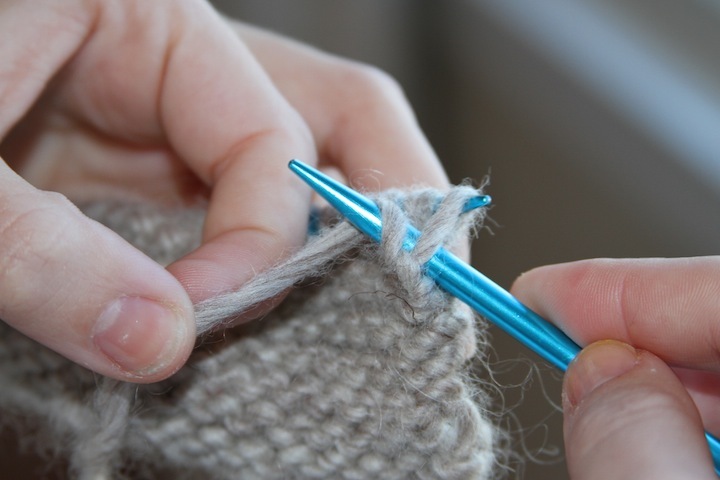 There are also two different styles of knitting : continental (left-handed) or english (right-handed). This simply refers to which hand you hold the yarn in. I am teaching english because that is how I knit, but I will teach continental in another post. Remove one needle from the CO stitches, so you are left with 1 needle holding all your stitches, and 1 empty and free. Take the first stitch on the LN and pull it off. 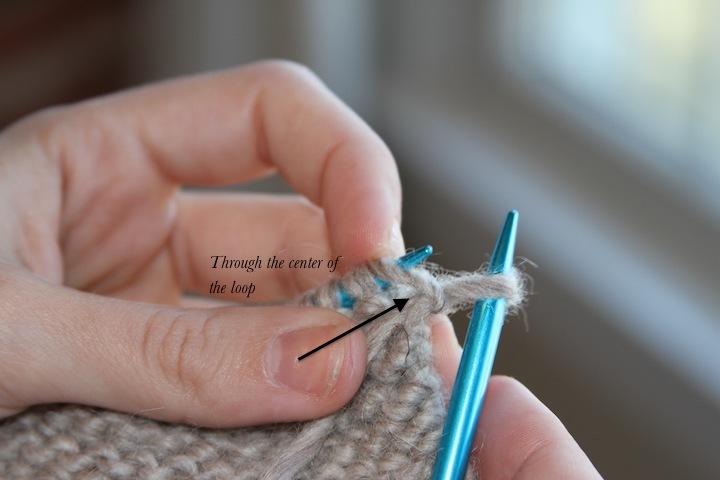 This is the slip knot you made in the beginning that is not a proper stitch. Hold the needle with the stitches in your left hand and the empty one in your right hand. When you did the CO, the end tail was in the front and the yarn tail in the back. Now that you turned your work over to start the next row, we will start with a PURL row. From right to left, insert the RN (right needle) through the first stitch and to the front. Wrap your tail counter-clockwise (from right to left) around your right needle. Holding your tail tight, push your RN back though the center of the stitch (the same way you entered). Take the stitch on the LN that you have been working with and push it off the needle. Repeat this until the end of the row. When you are finished with your row, all of your stitches will be on the RN. Flip the RN to your left hand to start your next row. You should see the ‘v’ pattern forming on this side. This means you use the knit stitch. To begin the knit stitch make sure your yarn tail is in the back. From left to right, place the RN (from the front of the stitch) through the middle of the first stitch and to the back. Wrap the needle with the tail counter-clockwise. Holding the tail taut, push the needle back through the way in came. Lift the RN up, and push the stitch off the LN. Repeat the knit stitch until the end of the row. You will notice your stockinette stitch forming. It is a beautiful stitch, however you may notice your project begin to curl. This happens and it cannot be flattened. To help it from curling there is often ribbing for the first few rows. Ribbing is made by making a pattern of knits and purls in the same row. Ex. : 2 knits, 2 purls. Are you thinking to your self “How do I get my front tail for purling to the back for knitting?” Ah, yes. well it is very simple. When you are finished with a purl stitch, for example, and ready for a knit, just bring the tail in BETWEEN the RN and LN to the back. Make sure you do not cross the tail OVER the needle. This with create another “stitch”. Sort of a phantom stitch that doesn’t belong there. If you are feeling ambitious and curious TRY IT! Anyway, we are not done yet! We still need to finish our project by casting-off. Casting off is almost exactly like knitting or purling. So, don’t sweat! It does not matter whether you end on a purl row or knit row. For the sake of those of you who are ending on a different row than what I will explain, I will use the word “stitch” in place of knit or purl. Then take the first stitch you made and lift it up, over the 2nd stitch and off the needle completely. Stitch one more stitch, so you have 2 stitches on your RN. Again lift it over and off your RN. For the last stitch, cut the yarn tail and pull it through the loop. All you need to do now is weave the ends in with a blunt needle. Ok now. So this is a lot of information and I can keep on going. There are a few more floating thoughts I’d like to get down, but not sure how to sew them into the other thoughts. So bare with me for just a few more minutes. I mentioned earlier the gauge, which also appears on almost all labels. This is an ESTIMATE of how many stitches per inch in a square. So, for the label above, for this yarn I would use US9 needles and end up with 16 stitches per 4 inches and 22 rows per 4 inches. HOWEVER, every knitter knits differently. You should always knit a square and measure your stitches before starting a project. Especially if it is something that requires accuracy for size. 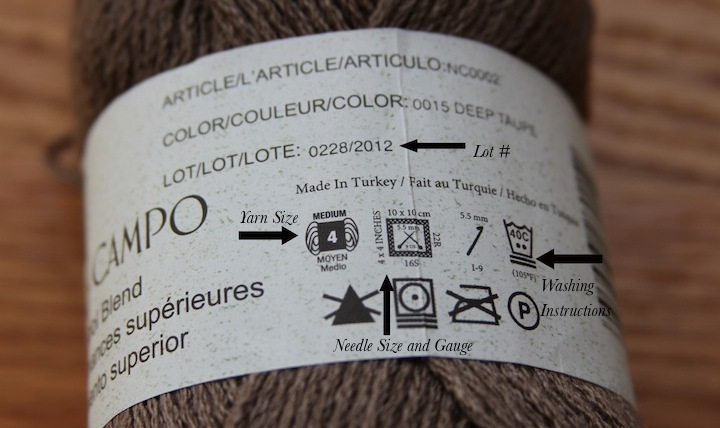 Lot number refers to the color of the yarn. Yarn is made in batches, and the dyeing process may vary, so if you buy the same color yarn from the same company with a different lot #, they may be slightly different. Also, just putting it out there, pom-poms are made separately and have nothing to do with knitting. I say this because I was helping Maddy pick out a hat pattern and she liked some hats, but didn’t like the pom-pom. So she looked for other ones. But I explained to her that they are made at the end and attached. 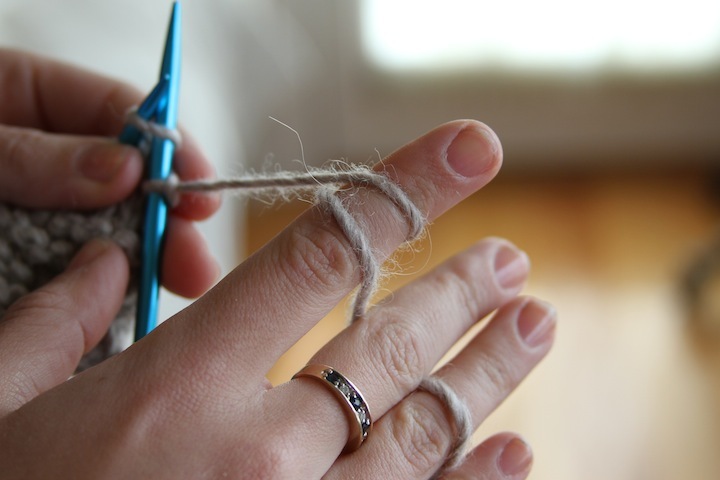 The yarn around my finger stays close to the needles (no more than an inch away), and I control the tension with my pinky and ring finger. And lastly, I want to mention counting rows. With scarves and beginner projects, it ‘s not of much concern. You should be getting to know the technique and get in the groove first. But it’s an easy thing to do, so why not get ahead, right? If you’re looking at the stockinette stitch, pick a column, and count each ‘v’ and include the stitch on the needle. THAT’S IT! If you’re looking at garter, it’s easier. If you stretch it a bit, you can see the knits in between the purls, so you can count each purl row by 2.